Undoubtedly, lower inventory levels can be problematic for buyers. With Calgary's inventory being low, buyers must make their buying decisions more quickly than they have had to make them over the past four years. Still, experts warn that this does not mean the seller has the advantage. While buyers must make faster decisions, they are still sensitive to prices and are looking for the homes that offer the best values. 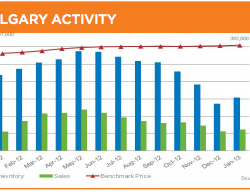 Unadjusted single-family benchmark prices have also shown improvement when comparing January 2013 to January 2012. Yet, despite the nine percent increase when compared to last year, unadjusted single-family benchmark prices have remained relatively unchanged when compared to December 2012. This is largely because price recovery occurred during the spring of 2012 under tighter market conditions. At this time, home prices leveled off and they remained that way for the rest of the year. In the townhouse and condominium market, the number of sales increased to 204 and 147 units respectively. Nonetheless, the number of new listings fell. Due to excess supply, the condominium apartment market has been relatively much slower to recover in Calgary. Declining listings and improved sales growth, however, have started to help the market improve. Furthermore, the unadjusted benchmark apartment price has increased by 7.5 percent when compared to January 2012 to $251,300 in January 2013. When compared to December 2012, they increased by one percent. The condominium townhouse benchmark price increased to $283,400, representing a 4.9 percent increase when compared to January 2012. When compared to December, however, they were slightly lower. Our January went off with boom, it seems! We did very well and got lots of leads... that's good because February doesn't seem to be panning out at as well. I hope your market continues to do well! Our market has really started to turn around in California. We are excited to see what this spring will bring! Thanks for the comment - I am sure spring will pick up for you guys too. Our market started out with a bang this year so far January and February have been really good months. Custom home builders also have a great deal of expertise in all areas of construction. Chances are, no matter what you want, they have gotten dozens of requests for the same thing over the years.